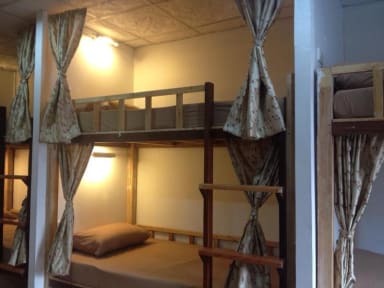 We are newly opened hostel in the town with brand new rooms and dorm beds. In Expensive and clean. All the beds have a facility of storing your bags/suitcases underneth. We are located at only 3 minutes walk from khaosarn road. Rest Inn is very quiet and cozy place where you can rest in peace. On the ground floor Rest Inn Dormitory has a restaurant where we serve delicious Thai and Indian food at very reasonable price. You can also order chilled beverages including local beers like Singha and Chang. While you are enjoying your meals you can also use our FREE WiFi service.